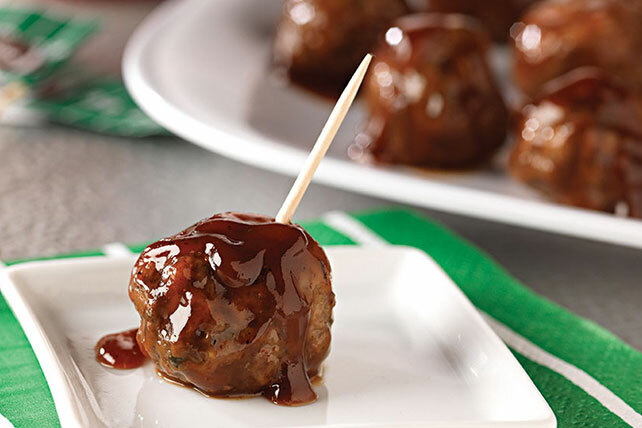 Use our BBQ Meatball recipe to make 84 servings of Zippy BBQ Meatballs for your next party! A.1. and smoky BBQ sauce make our BBQ meatball recipe so zippy. Mix bread crumbs and milk in large bowl; let stand 5 min. Add all remaining ingredients except barbecue sauce; mix just until blended. Shape into 84 (1-inch) balls. Bake 20 min. or until done (160ºF). Transfer to slow cooker. Add barbecue sauce; cover with lid. Cook on LOW 2 to 4 hours (or on HIGH 1 to 2 hours). Meatballs can be baked in advance; cool completely. Place in freezer-weight resealable plastic bag; seal bag. Freeze up to 3 months. Thaw in refrigerator before placing in the slow cooker and cooking with sauce as directed. For less heat, use only half the jalapeño pepper.